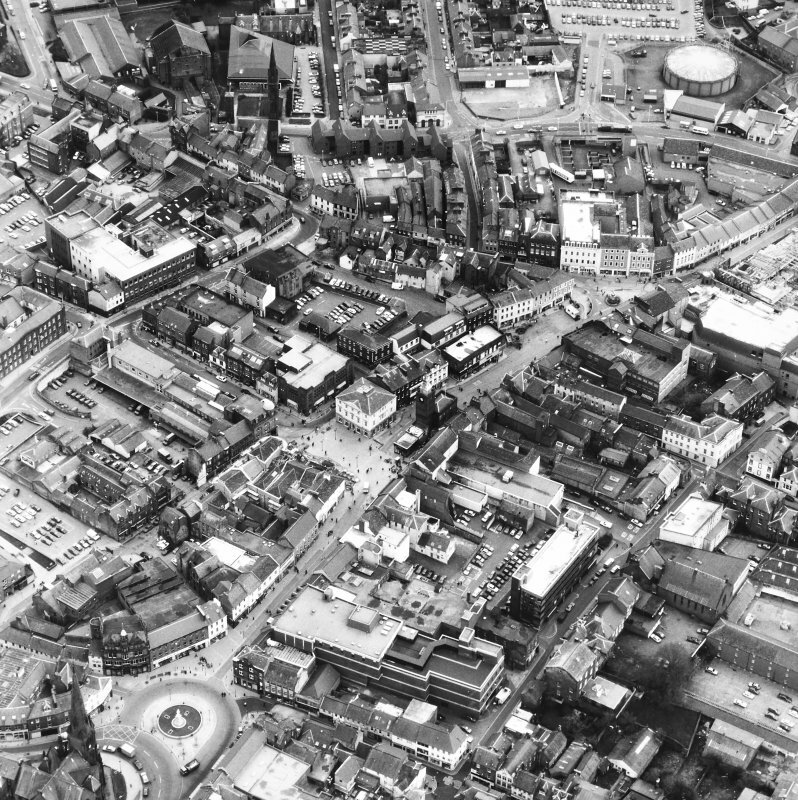 Photographic copy of historic photograph showing general view from south of Dumfries High Street including Midsteeple. 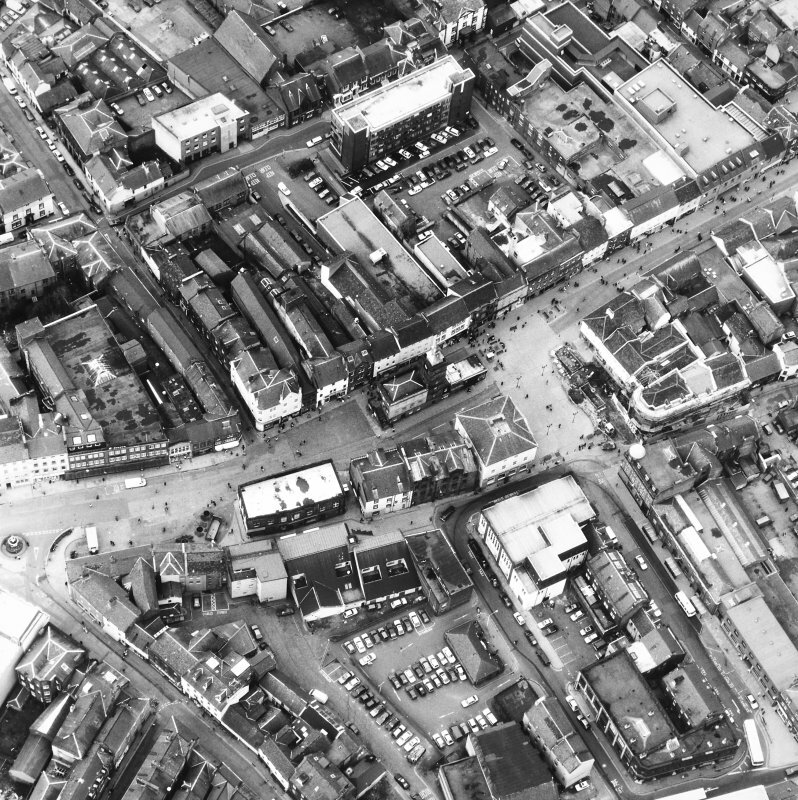 Historic photograph showing general view from south of Dumfries High Street including Midsteeple. 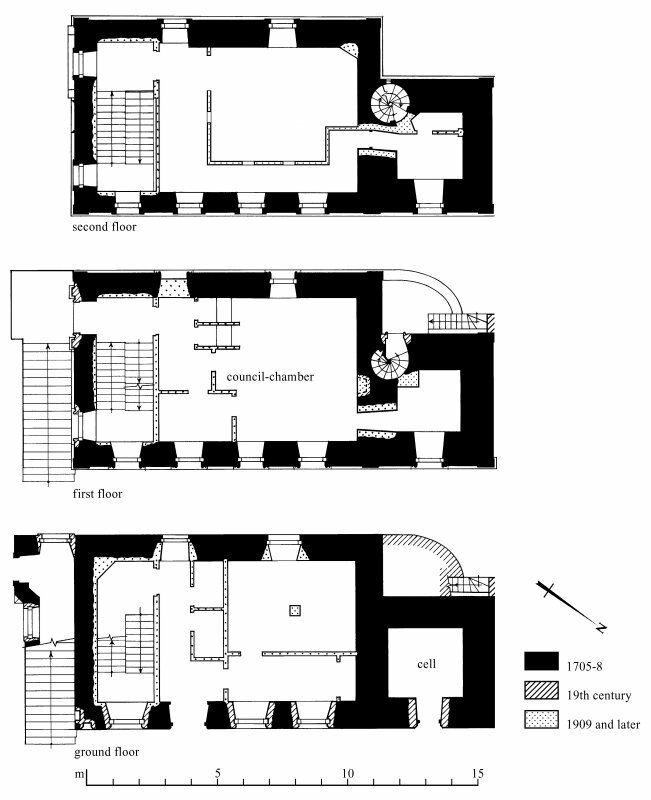 Plans: ground floor; first floor; second floor Preparatory drawing for 'Tolbooths and Town-Houses', RCAHMS, 1996. N.d.
South elevation Preparatory drawing for 'Tolbooths and Town-Houses', RCAHMS, 1996. 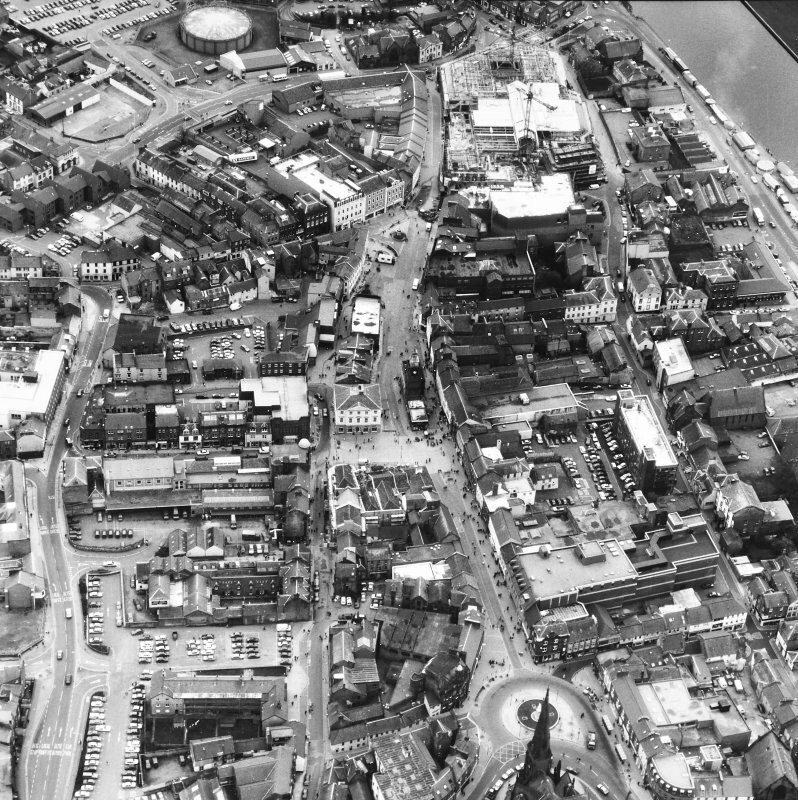 N.d.
View from south of Dumfries High Street including Midsteeple. General view. 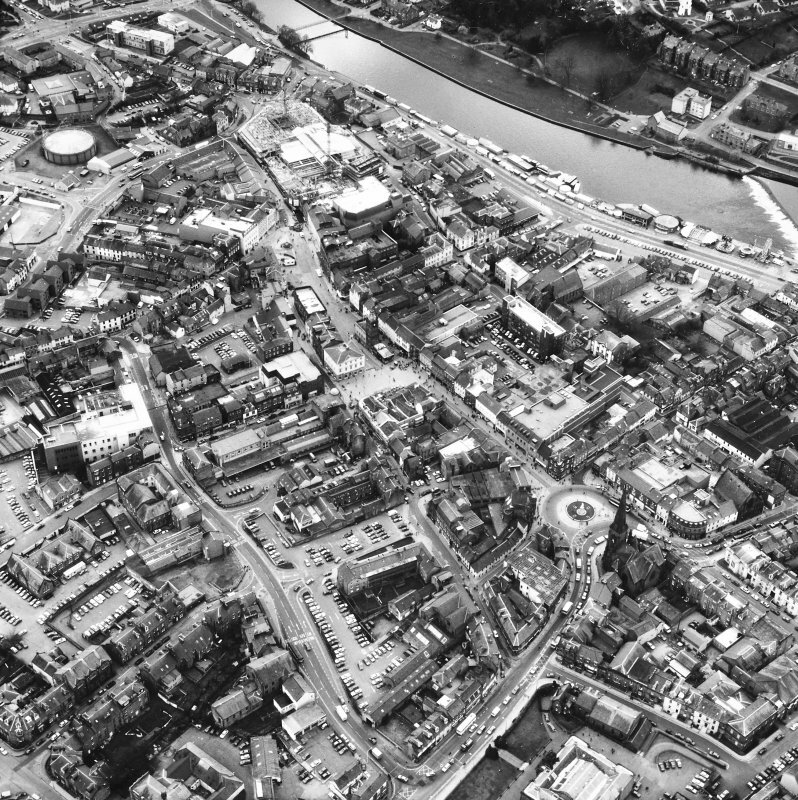 Titled: 'Town of Dumfries. 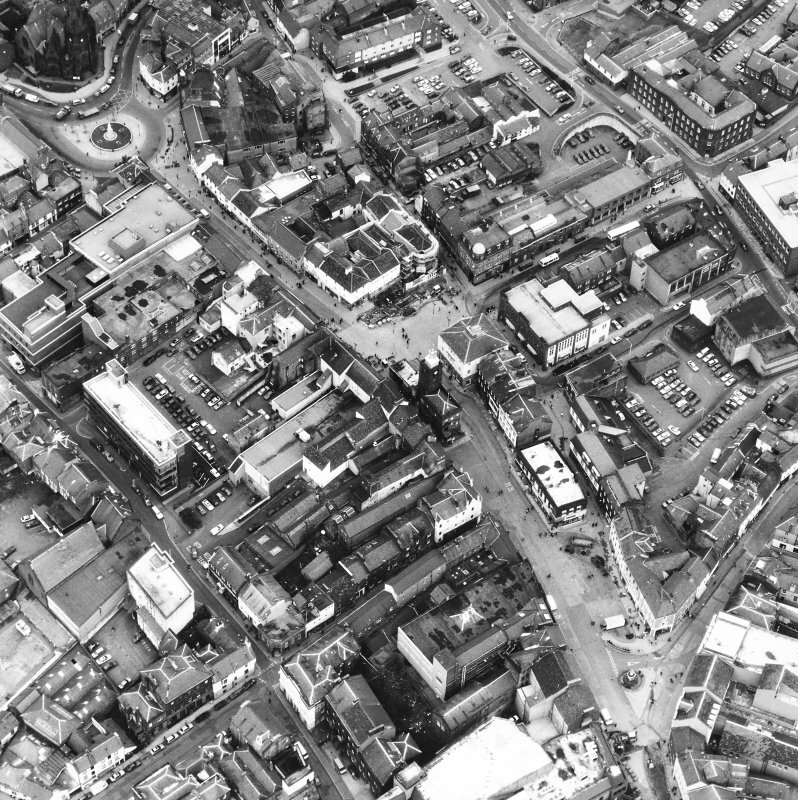 High St and Mid Steeple'. 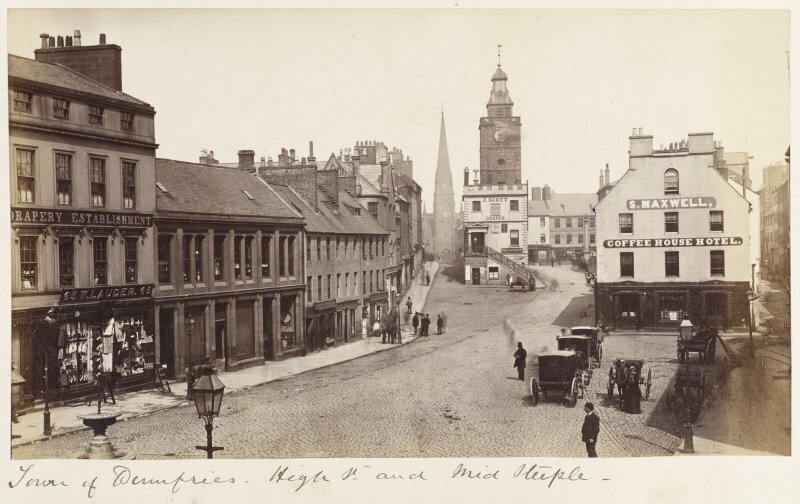 General view from south of Dumfries High Street including Midsteeple. 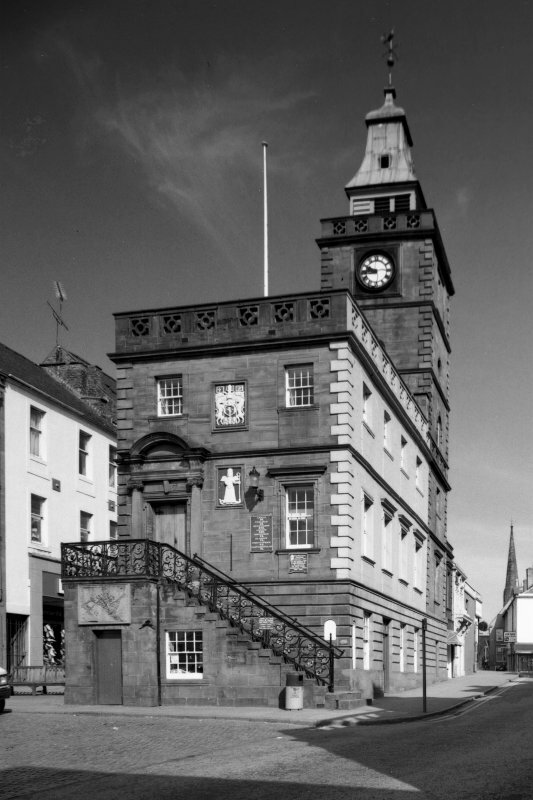 The Midsteeple, Dumfries town-house, is oblong on plan and three storeys in height; its square steeple is at the NE end. Modern shops abut its N end. The townhouse measures some 33 1/2 ft by 19 ft within walls 2 1/2 ft in thickness; and the steeple about 17 ft square over walls averaging 4 1/2 ft in thickness. The whole of the ground and first floors of the townhouse, originally containing the weigh-house, town-guard house, and town hall, are now converted into showrooms, while the second floor is used as a workshop. The date '1707' is incised over the entrance, at the S end. This building is an early 18th century structure with no outstanding architectural features. A stylish three-storey town house built by Tobias Bachop of Alloa 1705-7. The NE built tower is topped by a prominent fleche and the opposite end-wall has carved panels and an external forestair with an attractive wrought-iron balustrade. The predecessor of this building was demolished in or after 1719 but at the end of the 18th century a prison, possibly the tolbooth annexe of 1579-83 still stood 'nearly adjoining' the town house. G Stell 1982; W McDowell 1867; W R McDiarmid 1886; D MacGibbon and T Ross 1892; R Edgar 1915; NMRS plans DFD/61/1-2. Archive to be deposited with the NMRS. Sponsor: Dumfries and Galloway Council. Non-Guardianship Sites Plan Collection, DC28329- DC28337, 1909, 1954 & 1970- 1971. Photographic survey by the Scottish National Buildings Record/Ministry of Work in October 1964. 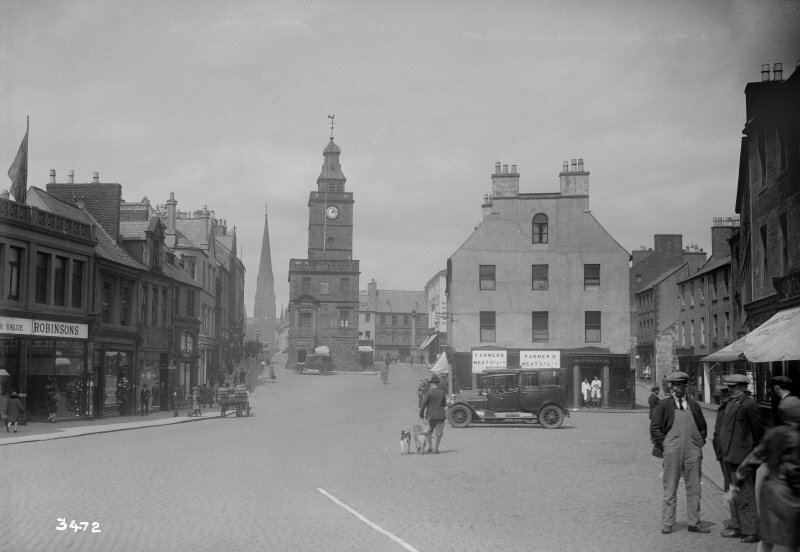 The first mention of a Tolbooth in Dumfries occurs in 1481. It was pawned by the Town Council in 1566/7, but was soon redeemed by them after the sale of Greyfriars (Reid, 1915, 147). It had cellars in the basement, shops on the ground floor and a council chamber above. 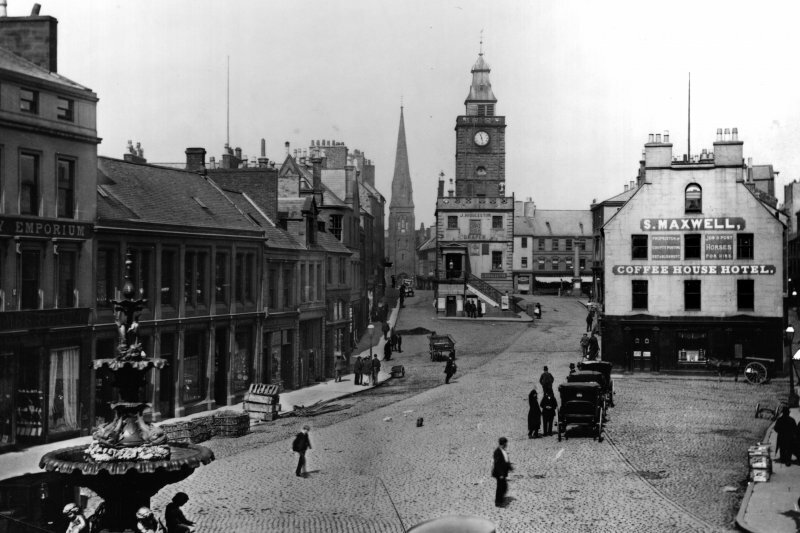 Originally the tolbooth was thatched, but slates were added later and an outside clock by 1533 (Shirley, 1915, 30). 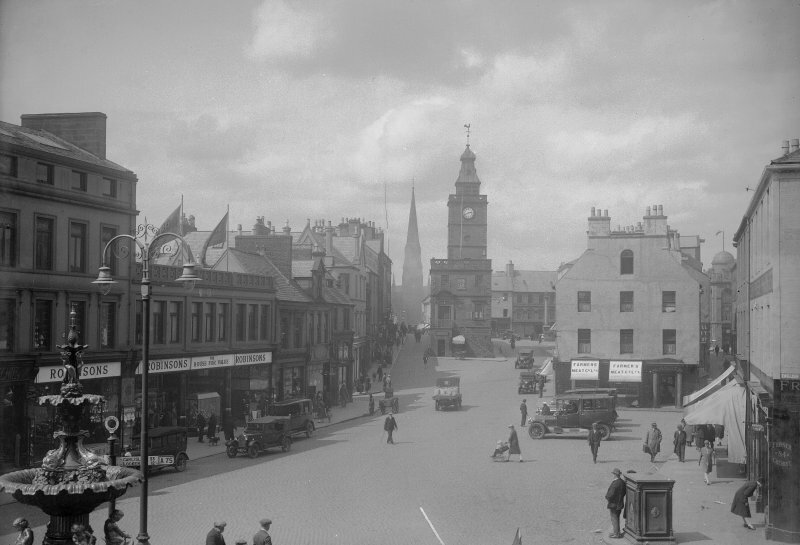 The Tolbooth was pulled down and a new one, the Midsteeple was built by 1725. 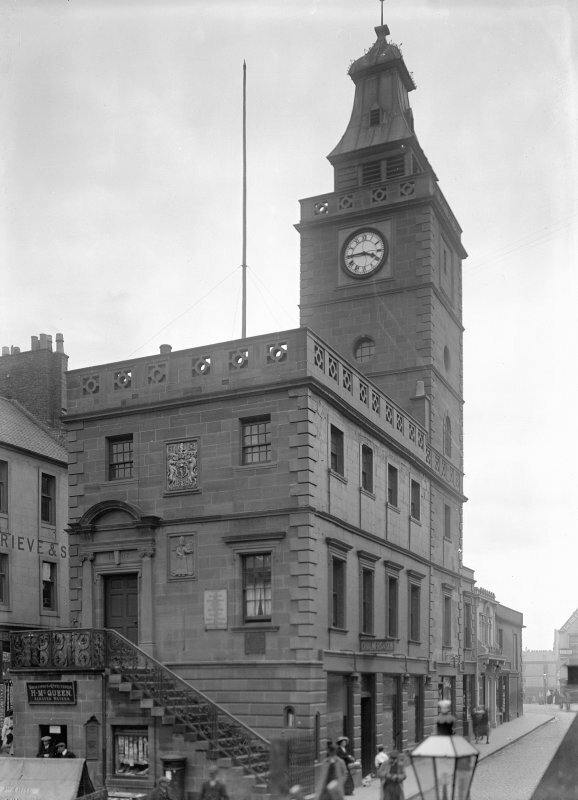 The new Town House occupied a prominent position in the High Street and in addition to a writing office for the Town Clerk and council rooms, it also housed the burgh's magazine (Reid, 1915, 148). At the command of the Privy Council in 1575, burgh officials had a 'sufficient prisoun-hous' constructed on the north side of the Tolbooth. Prior to its erection prisoners had been lodged in the Tolbooth, but it had proved to be insufficient (Reid, 1915, 148). That jail was apparently not a strong building and was wrecked by fire in 1742 (Reid, 1915, 44). 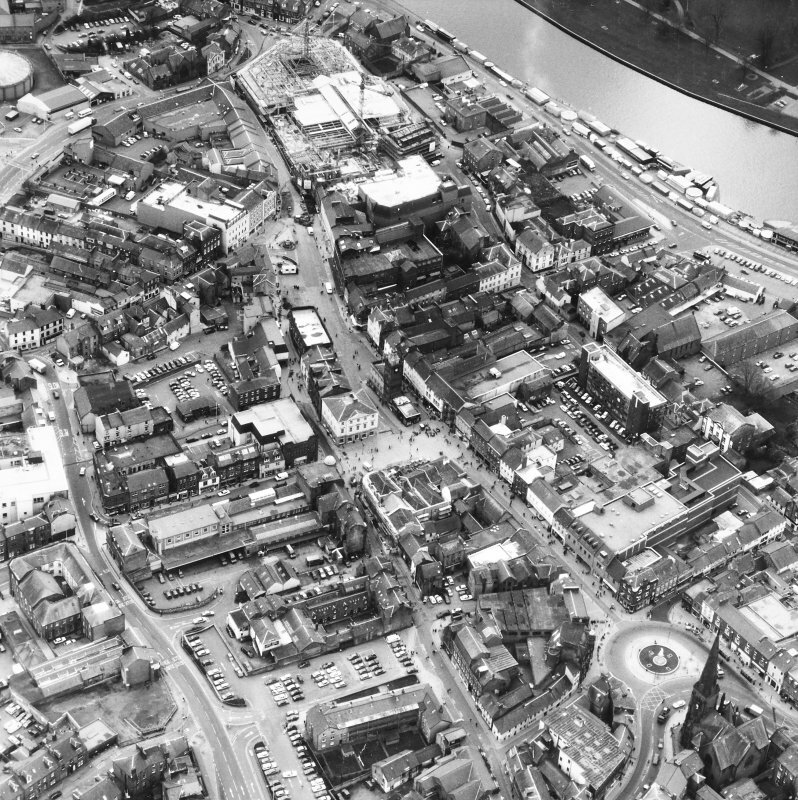 Information from ‘Historic Dumfries: The Archaeological Implications of Development’ (1977). In April, 1703, having received a sum of 20,000 merks from the sale of their share of the Tack of Customs and Foreign Excise, the magistrates of Dumfries resolved to spend the money in the building of a new town house. 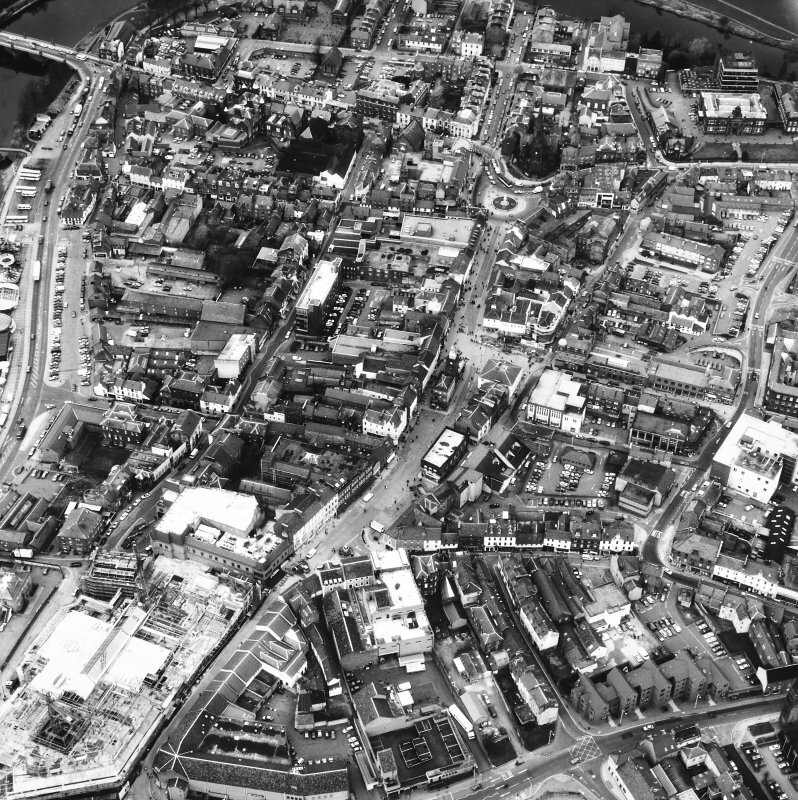 They felt that 'the town is not at present provided with suffIcient prisons, whereby several malefactors guilty of great crimes, and others for debt,have made their escape, to the dishonour and imminent peril of the burgh; . 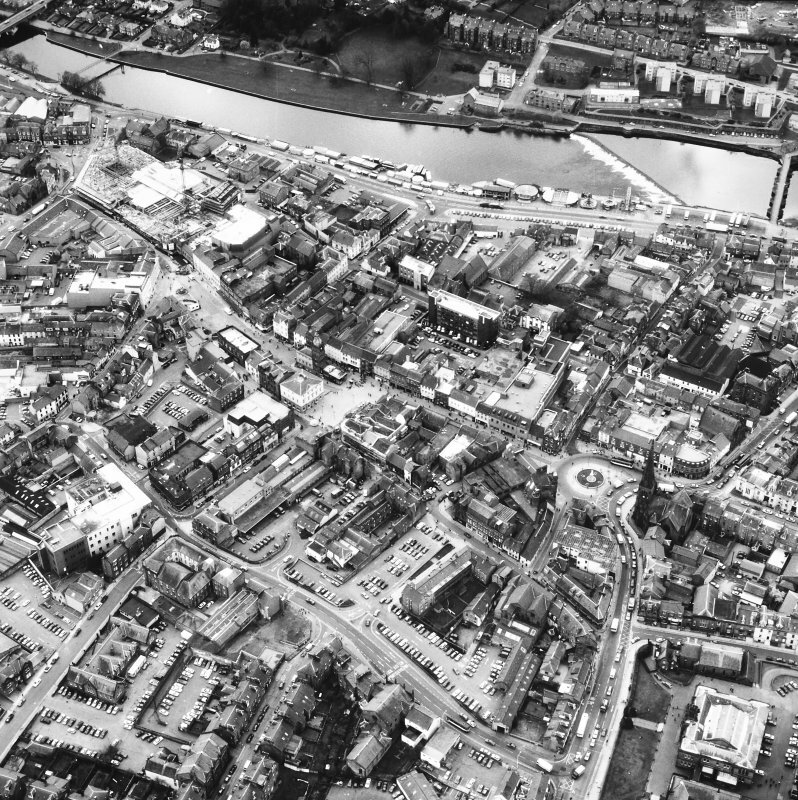 . . also that there is not a steeple in the whole town, nor a suitable council house and clerk's chamber for keeping the charter chest and records of the burgh, nor a magazine house, nor room for the sure keeping of the town's arms and ammunition . . .'. The Steeple Committee engaged a Liverpool architect John Moffat, to 'furnish a model'. His design was based on the College steeple in Glasgow, and in early 1705 the committee turned to Tobias Bachop of Alloa, one of Sir William Bruce's trusted mason-architects, to put it into effect. Timber was obtained from Garlies Wood above Newton Stewart, and Bachop agreed to supply other building materials. He was to construct the building 'conform to the scheme drawn, and the alterations of the dimensions which the CommIttee had made' by Martinmas (11 November) 1707-which he did. The balustrade of the external forestair was completed in scrolled wrought iron, not stone as originally intended, and was the work of an Edinburgh smith, Patrick Sibbald. The total cost was just less than £1,700, out of which Bachop's contract had been for the equivalent of about £1,050. The masonry, partly refaced, is of red sandstone ashlar throughout, channelled on the lowest storey and on the quoins. Each level is marked by a moulded stringcourse, and the uppermost levels have pierced stone parapets, the steeple being topped with a lead-covered wooden fleche. The main doorway is at first-floor level in the south end wall, reached by the external forestair. The principal meeting rooms and offices were originally on the first floor of the council chamber block sandwiched between a ground-floor guard house and tron (weights office) and a series of second-floor prison-cells. 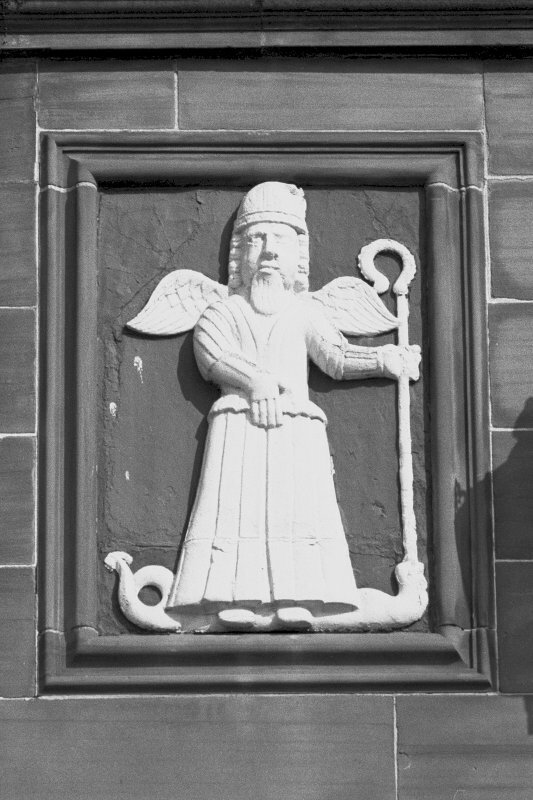 There are two relief carved panels on the south wall: the upper one bears a royal armorial, the lower one the figure of St Michael, below which there is the iron mileage panel of1827 (see Chapter 2). In the west wall there are two inscribed stones from the building's late 16th century predecessor. It was demolished in 1719, but at the end of the 18th century an old prison block still stood 'nearly adjoining' the town house. 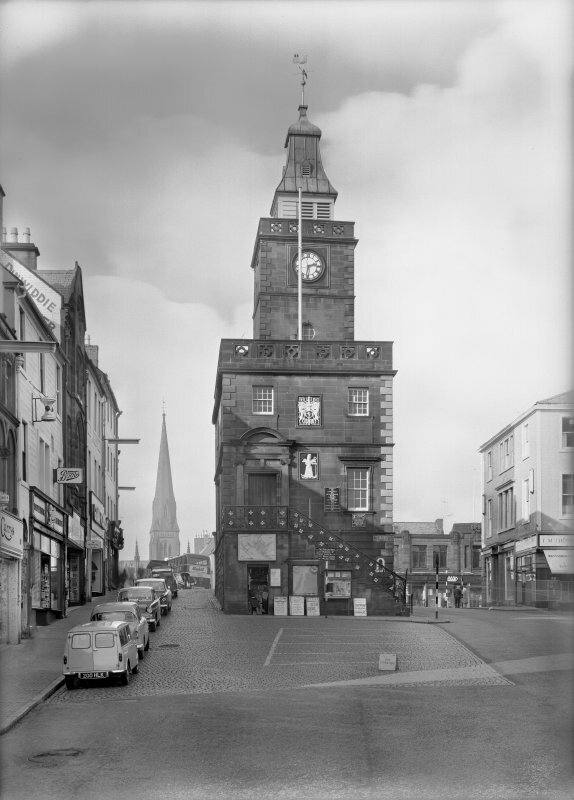 The town-house or 'Midsteeple ', which was built in 1705-8, lie occupies a prominent island site in the High Street, to the SW of Queensberry Square. Its S end-wall, which has a straight forestair to the first-floor main entrance, overlooks the former market-area. The N wall is abutted by two-storeyed properties which in the 19th century replaced a lower block of shops supporting on its flat roof the 16th-century mercat cross. The three-storeyed main block is rectangular on plan, measuring 11.8m from N to S by 7.5m, and a square steeple, 28m in height, extends the E front a further 4.2m to the N. The masonry is of red sandstone ashlar which was originally obtained from the town's quarry at Castledykes, but was extensively refaced in 1909. The roof is hipped and slated, and the spire is lead-covered. The forestair of the S front, which incorporates a small ground-floor shop, has an elaborate wrought-iron balustrade or 'ravel' made by Patrick Sibbald, an Edinburgh smith, in 1709. It comprises a series of panels, divided by thistle-shaped balusters and each containing two scrolled and floriated tendrils which have been much restored. The first-floor doorway, which has Ionic pilasters and a segmental pediment, bears the date 1707 on its lintel, but in its present form it dates from 1909. An earlier doorcase with thin pilasters and a plain entablature appears in a drawing of 1828, shortly before the construction of the Doric portico that is a familiar feature of early views of the building. The fenestration of the Sand side walls is regular, with the windows of the upper storeys having projecting aprons and those at first-floor level also having moulded and lugged surrounds with cornices. The ground storey, and the stepped quoins of the main block and steeple, are of channelled ashlar, and the upper storeys and parapet, as well as the stages of the steeple, are defined by moulded string-courses. Both the main block and the steeple have stone parapets containing square openings which enclose pierced roundels set within crosses, and the wall-head parapet is continued as a decorative frieze round the steeple. The next three stages of the steeple contain respectively a round-headed window to the E, a series of oculi, and circular clock-faces within square moulded frames. The parapet encloses a square timber belfry with an ogee-capped lead-covered spire whose angles were originally crocketed. 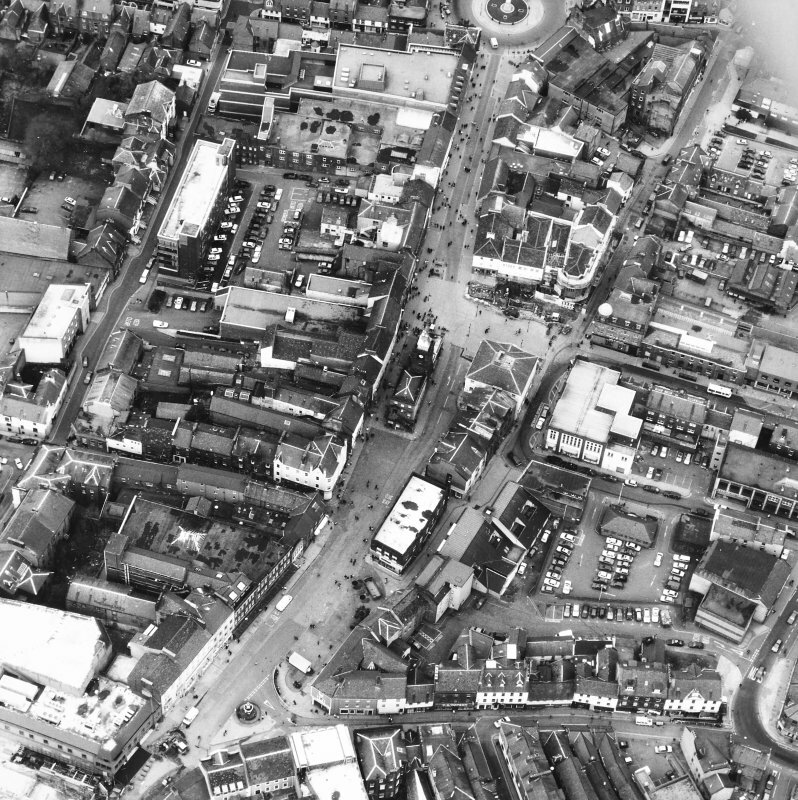 The building has undergone several changes of use (infra), and for many years after 1866 it was occupied by shops and warehouses. The interior now contains one large room at each level, divided by modern partitions and preserving no early features. The ground storey of the steeple is entered by a doorway in the E wall, and the upper storeys by a forestair against the W wall which leads to a newel-stair in the SW angle. Direct access to the steeple from the main block was created in 1909 by inserted doorways at first- and second-floor levels. Set at the centre of the S front, at first-and second-floor levels, there are two carved panels. 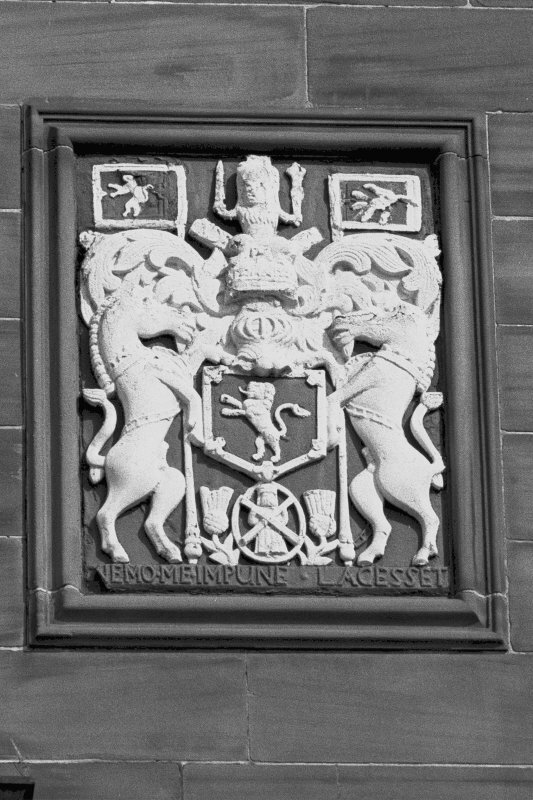 The upper one contains a full armorial achievement bearing the royal arms of Scotland, with unicorn supporters. The lower panel shows the winged figure of St Michael, patron of the burgh, wearing a mitre-like head-dress and long robe and standing on a dragon, into whose mouth he thrusts the point of a crozier. These carvings are probably of mid 17th-century date, and two others built into the W wall in 1909 came from the nearby old prison of about 1579 (infra). One bears the initials H Rand R MK, with a pair of shackles and a bow and arrow and the word BAILLIES, for Herbert Raining and Robert MacKinnell who held that office in the 1570s. The other shows a shield bearing a chevron between three fleurs-de-lys, with the town 's motto A LORJ BURNE. Also built into the S front there are the metal 'bed of a yard-measure, probably of about 1830, and a cast-iron distance-plate of 1827. The three bells in the belfry, of eight, five and three hundred weights, were cast by George Barclay of Edinburgh in 1708. The larger ones were recast in 1903 and 1901, but the original small bell, whose 'small and short' tone was the subject of initial complaints, survives in good condition. It measures 0.62m in diameter and is inscribed: FOR THE TOWN OF DRUMFRlES 300 LIB WT ED(JNBU)R(GH) 1708. When the bells were set up, there was insufficient room for the two smaller ones to be rung together, and the timberwork of the belfry was altered. A projection in its N wall still accommodates the wheel of one of the bells. The original clock of 1708, which had four dials, was made by John Bancroft of Stockport, and some fragments of the mechanism remain in Dumfries Museum. 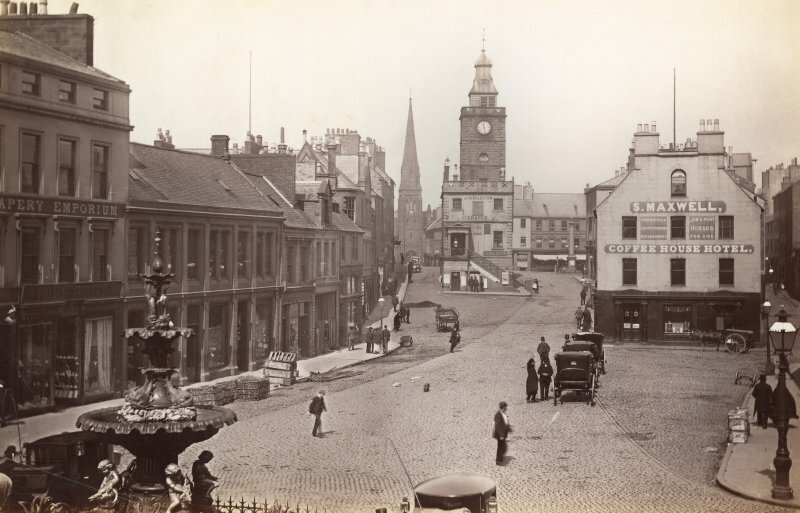 The 'Old Tolbooth', situated on the E side of the High Street close to the site of the Midsteeple, was probably built in the last quarter of the 15th century. At the time of its rebuilding about 1719 it contained vaulted cellars in the basement, shops on the ground floor and a council-chamber and 'open prison' on the upper floors. In 1578-9 the Privy Council ordered the town to build 'ane sufficient prisoun-hous of three hous hicht' adjoining the tolbooth to the N. This 'pledge house', which was vaulted at two levels and incorporated the carved stones described above, remained in use until a new jail was built in 1807. In 1697 the burgh was granted a share of Scottish customs and foreign excise duties, and after pressure from the community over the council's conduct of the affair a sum of 20,000 merks (£1,111 sterling) was secured. In 1703 a joint committee of the council and community was appointed to apply this sum in building the midsteeple, and its minute-book preserves a uniquely detailed account of the execution of a major civic building-project. After an unsuccesful attempt to secure the services of 'Mr James Smith, James Smith his nevoy or any other Architect' in Edinburgh, a Liverpool 'masterbuilder' named John Moffat was employed 'to draw a scheme and modall of the designed fabrick'. Moffat produced his plans in April 1704, after viewing the steeple of Glasgow College as a possible model, but declined to undertake the contract. An offer from Bailie Kennan to erect the building on a reduced scale was refused, and in February 1705 a contract was made with Tobias Bachup of Alloa 'to construct the samen conform to the scheme drawn and the alterations of the dimensions which the committee had made'. In May 1705 it was agreed to lengthen the council house from 9.75m to llm and to adjust the windows, and the foundation-stone was laid at the present site, which had finally been chosen in preference to that of the old tolbooth. It is probable that the building as executed owes its main elements to Moffat's 'scheme', but that the details were amended by Bachup. The latter in 1708 claimed expenses given to the deacon of the wrights 'for going to see other steeples that he might know how to make the spire of the Steeple', which closely resembles those of Glasgow College and Stirling townhouse. 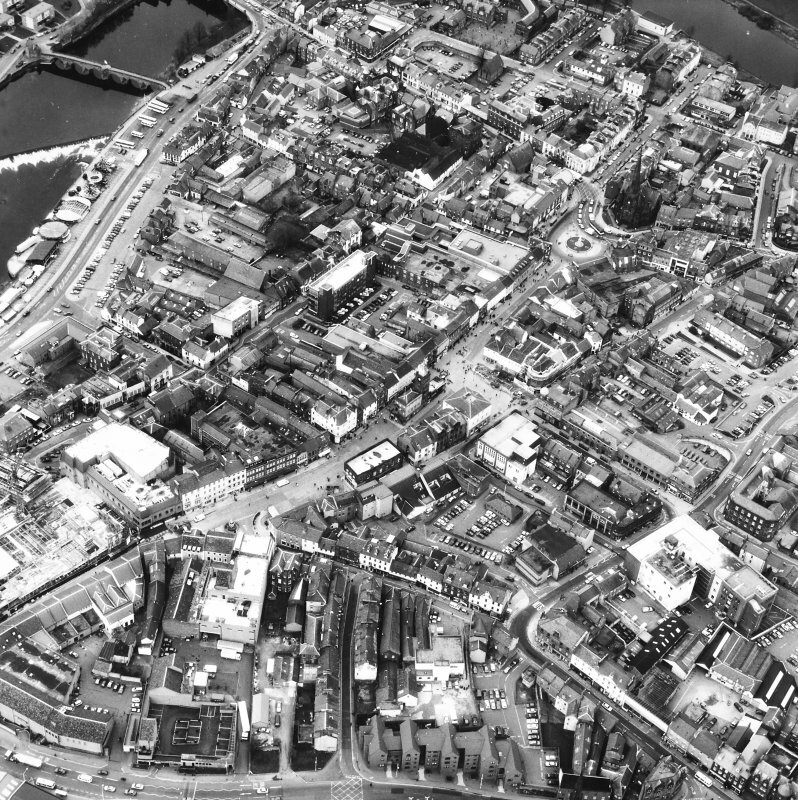 Since 1703 the committee had been acquiring building materials, and contracts were negotiated for the re-opening of the town's quarry and for the supply of lime from Annandale. Efforts to secure a ship for bringing timber from the Baltic failed, and suitable material was finally located at Garlieswood near the River Cree. These materials were made available to Bachup, who agreed to furnish the remainder as part of his contract price of 19,000 merks. Thereafter the minute-book records the payment of regular instalments until the completion of the contract in 1708, and the subsequent negotiations for the bells, clock and iron 'ravel'. 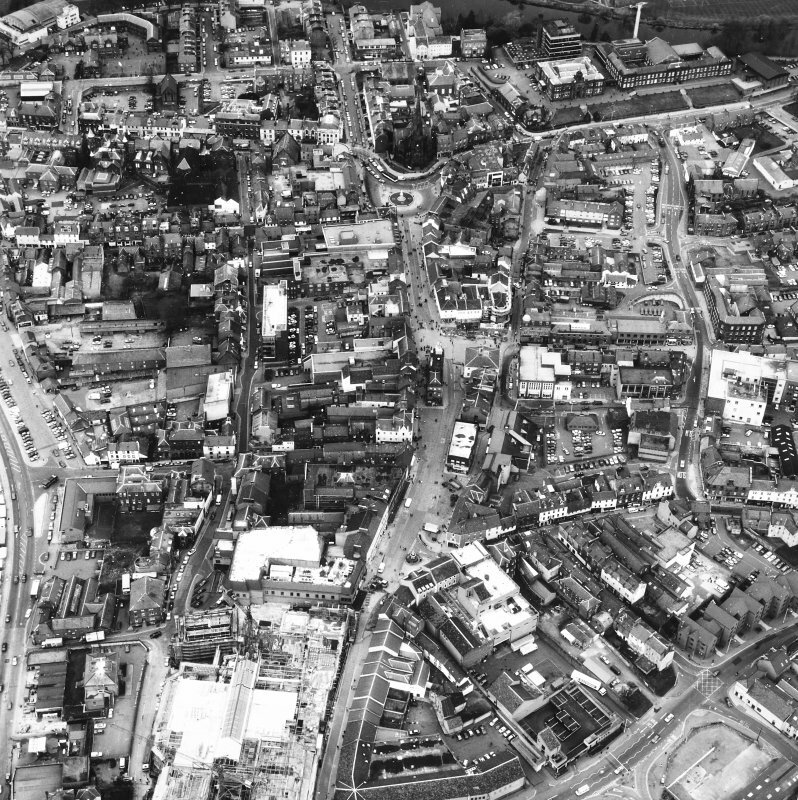 In 1703 the town council had agreed that 'the town is not at present provided with sufficient prisons ... as also that there is not ane steeple in the whole town, nor a suitable councilhouse and clerk's chamber for keeping the charter-chest and records of the burgh, nor a magazine house nor room for the safe-keeping ofthe town's arms and ammunition'. However, most of these functions were retained in the old prison and in the adjacent building which replaced the old tolbooth in 1725. The first floor of the Midsteeple was used as a courtroom and town hall rather than its intended function of a council-house until 1830, when the new portico was added to mark its additional dignity. In the 18th century the ground storey contained a weigh-house and guard-house, and there was also prison-accommodation which may have been in the steeple. 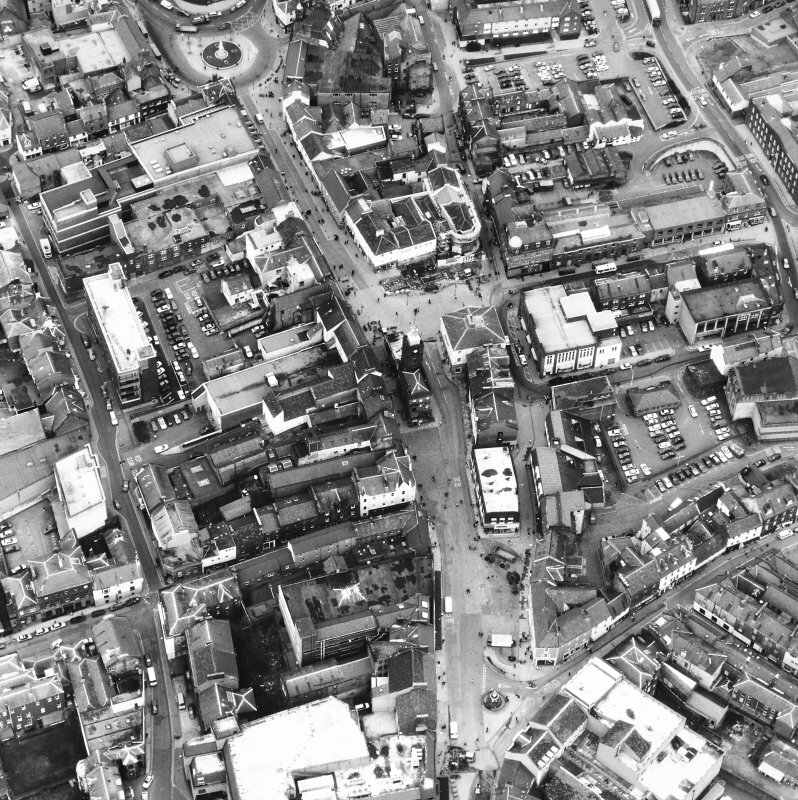 Later the ground storey was given over to shops and a lock-up, probably in the base of the steeple, and the second floor became the police superintendent's residence. After 1866, when a new town hall was built, the whole building was used for shops and warehouses, and it remained in commercial use even after the extensive renovation 1909, which was superintended by the local architect James Barbour. 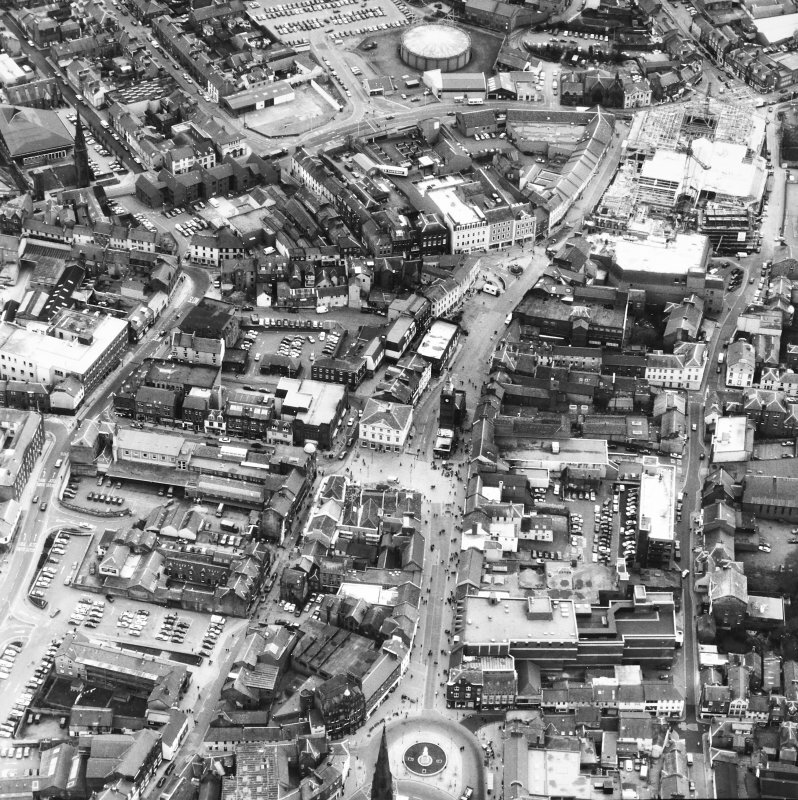 In the early 1970s the interior was adapted for local authority use.